I tried your modified plugin, but it failed with errors in my Eclipse 3.5.1 environment. Next I imported, compiled and deployed the original version. It works fine, but it's missing your nifty filtering capability. Any chance you could post the changes you made --- or the modified version of the workspace project for this tool? 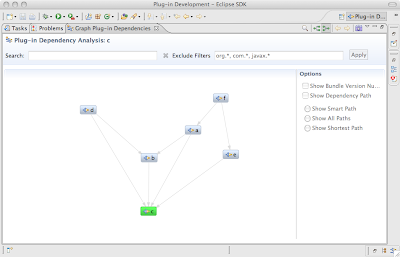 I provided an updated version compatible with Eclipse 3.5.x. It would be a useful addition if this tool could show also project dependency graph. Just worked fine. Thanks mate. It would be great to get sth equivalent for OSGI Declarative Service dependencies.